Spongex pool loungers and floats, proudly manufactured in the USA, are constructed from high quality Aqua Cell foam with rich color that permeates the float for long-lasting durability. 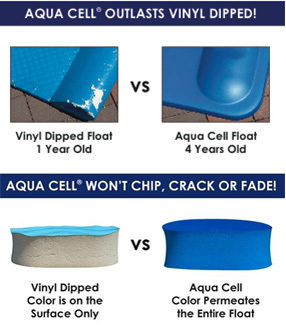 Aqua Cell foam is UV and weather resistant and is unaffected by pool chemicals, ensuring that your float will not fade, peel, crack or chip when left out in the sun. Unlike “vinyl dipped” floats that only have an outer color coating, our specially designed formulation for commercial use guarantees that our floats will hold up longer than the competition use after use. We also offer custom silk screening from 12 inches to 40 inches.